Since it is not always possible to travel to every location where there are records of interest, it is often necessary to write letters in order to retrieve information. Sometimes a letter must be sent to someone who works where a record is stored. Sometimes it is necessary to send a letter to a researcher who is able to retrieve a particular record for you. If you need help knowing what to include in a letter or how to write it, there are several resources available both on-line and in print. Some of these sources also provide help with writing letters in foreign languages. After the letter is written, the filing of such a letter and its reply may be handled using a Family Research Folder, in the following manner. After writing a letter, always make a copy of that letter so you will have a record of what you asked for, when you asked for it, and whom you asked. After you have written your letter, take the Correspondence Index from the appropriate Family Research Folder. Under the correct headings fill in the name and address of the person to whom the letter is written, and the information you requested. After you mail the letter, record the date it was sent. After entering the information into the Correspondence Index, locate the proper Research Log for the document being requested. Fill out the Research Log indicating which source is being searched, what information is being sought, and how it is being searched—by correspondence. The date of search is the date the letter was mailed. The copy of each letter sent receives a unique Correspondence File Number. The first entry made on the Correspondence Index becomes #1, the second entry becomes #2, etc. The Correspondence File Number is written on the proper line of the Correspondence Index and on the bottom of the copy. 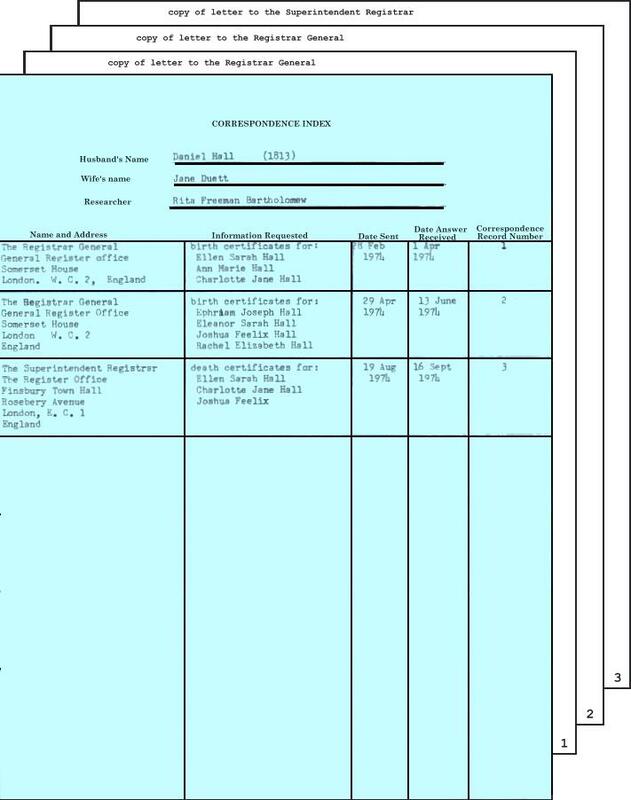 The copy of your letter is filed behind the Correspondence Index. Then wait for a reply. The Correspondence File Number used in filing letters has no connection to the File Number used in filing documents. Each numbering system is separate from the other. Because of this both numbers may be listed on the Research Log. Upon receiving an answer to your letter, write down the date you received a reply in the Correspondence Index. Then attach the reply to the copy of the letter it answers, in order to keep questions and answers together. After filing copies of letters together, it is time to file the genealogical information received through the correspondence. 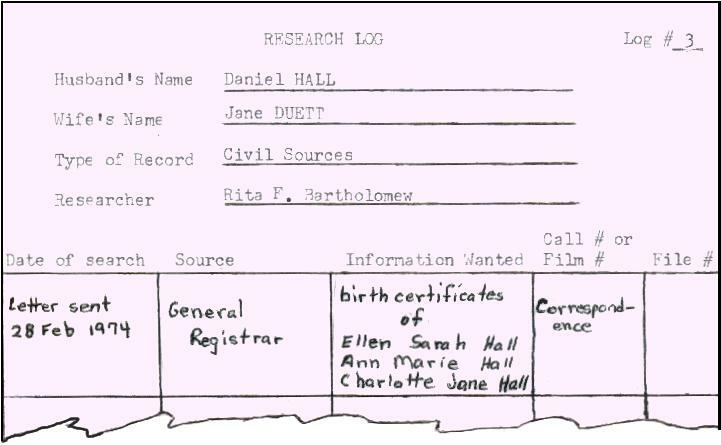 If there was genealogical information in the letter itself, extract the genealogical information onto a separate piece of paper. Be sure to cross-reference it to the letter by indicating where the information came from, who did the research, when the letter arrived, and any other specific information needed to easily identify from which letter the information came. Whether the genealogical information you received was a separate document or extracted information from the letter, you will need to indicate on the appropriate Research Log that you received the information through correspondence. This can be done by listing the Correspondence File Number in the call number section of the Research Log. Since each document needs to have a File Number, number the new document with the next consecutive file number. In addition to writing this number on the document, record it in both the Research Log and Index. If there was no genealogical information provided in a letter response, then make a note to that effect (such as nil or nothing found) in the appropriate place on your Research Log, just as if you had searched the source yourself. you can place the reply into one folder and make a cross-reference from the other folder(s) to the folder that contains the reply. 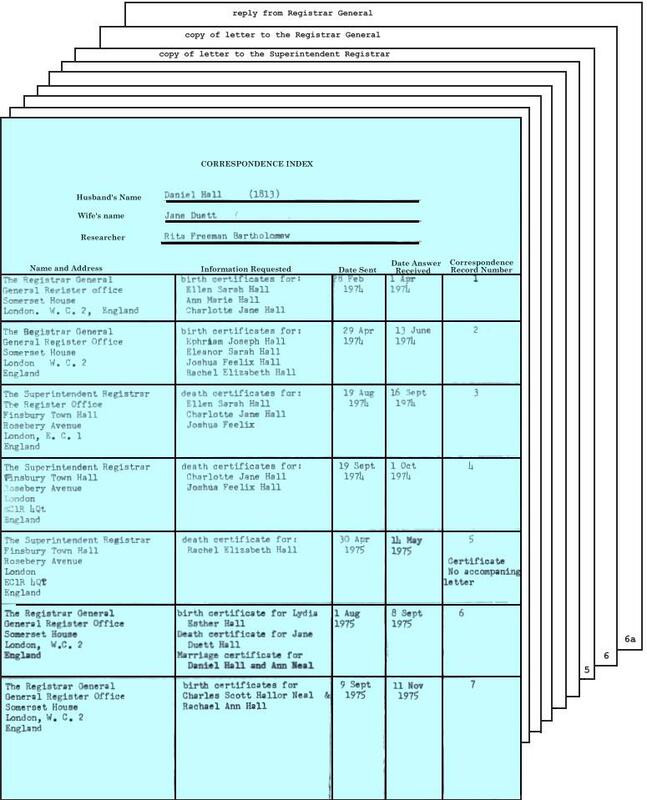 In either event, a copy of the genealogical information should go into each of the Family Research Folders to which the information pertains. Now that you have set up one Family Research Folder and used it in your research, you will be able to set up as many as you need by repeating the same process.